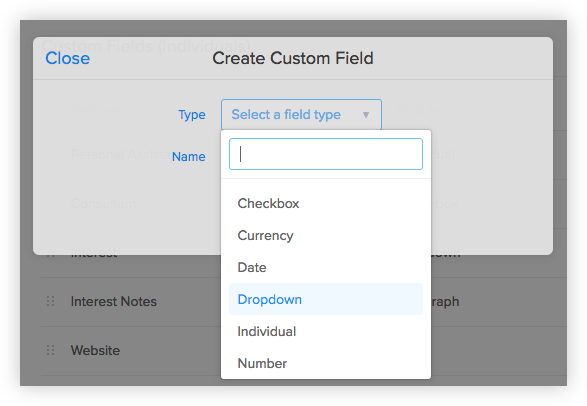 Custom fields allow you to create a field to record data that you want to capture, in addition to the standard fields available. For example, you may want to capture an organisation’s Industry Vertical, Next Action, VAT number, or a Billing Contact. 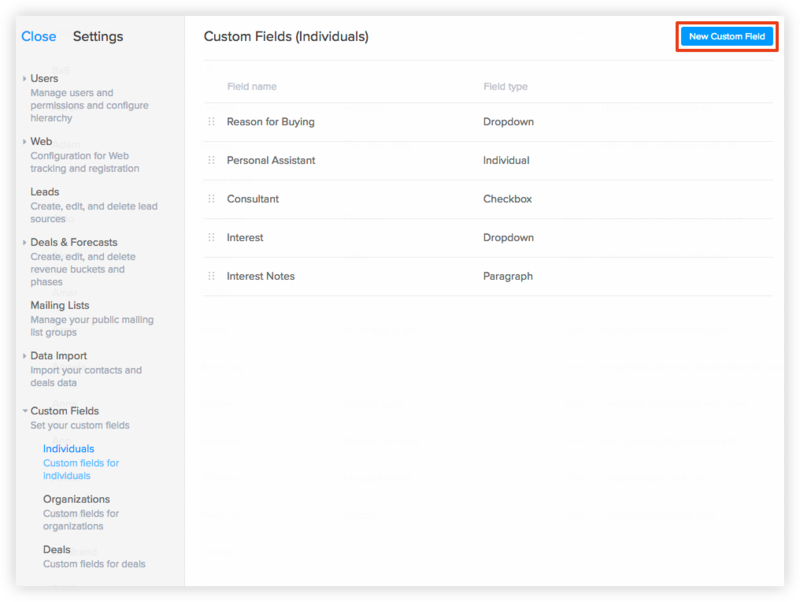 You can set custom fields on your Organization, Individual and Deal records. Custom fields are created in the Settings Panel and the field will then appear on the edit screen for the record type it was created for. Once the field is filled out in the Edit screen it will then appear on the detail view. Custom fields become a very useful tool when used in conjunction with Smart Groups, in the Contacts & Deals section. By capturing more specific and unique data you are then able to easily segment dynamic groups that update automatically as the records change. What field types are there? Dropdown - you can provide the custom dropdown values. Paragraph - like Text, but with a bit more room. Image - provide a URL to an image. Organisation - dropdown that allows you to select a link to an Organization record. Individual - dropdown that allows you to select a link to an Individual record. 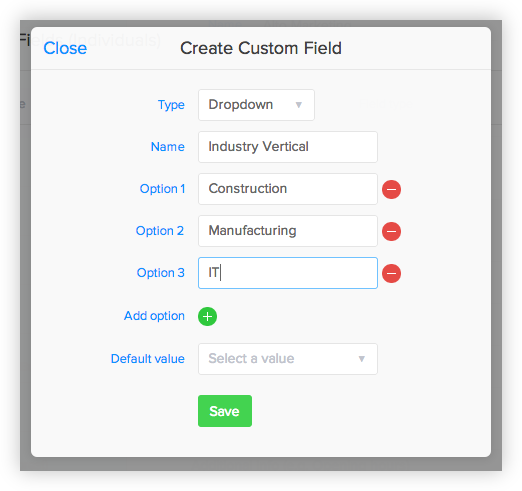 To create a new dropdown custom field that displays the industry vertical an individual belongs to go to App Settings > Custom Fields > Individuals. Select a type of custom field. In this case we're going to choose Dropdown. Give your custom field a name. If you've chosen a Dropdown as the field type, you'll be able to enter all of the dropdown options here. The next time you go to edit an individual the field will appear. Once filled in the details will be visible against the individual contact record. Question: How many custom fields can I create? Answer: You can create as many different custom fields as you require. Question: Will all other users be able to see the custom fields? Answer: Yes, custom fields are visible to all users in the system. Question: Can I make custom fields mandatory? 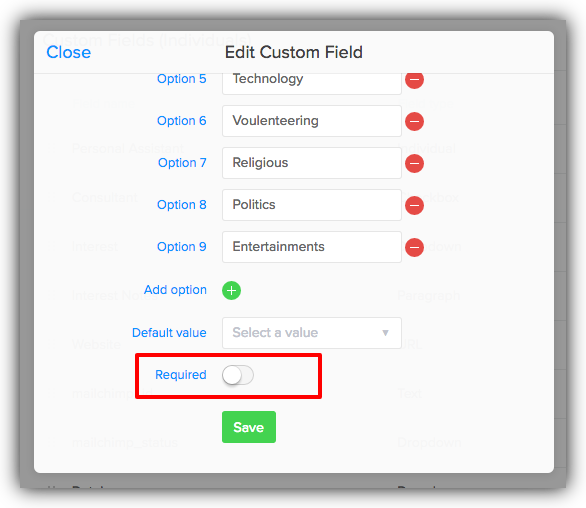 Answer: Yes, you can make custom fields mandatory by selecting the 'Required' checkbox before the save button. Question: Can I change a custom field later? Answer: Yes, you can change the title and any of the values. Please note that if you delete a custom field all the data on the contact records will be lost. This includes data that you added to historic records. Question: Can I delete a custom field? Answer: Yes, you can delete a custom field but all the information held in that custom field will be lost. Question: Can I make the default fields mandatory? Answer: No, you can currently only make custom fields mandatory.